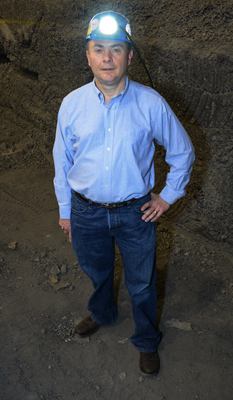 NIOSH Mining researcher John Sammarco in the simulated mining environment where he tests the NIOSH LED prototype cap lamp. The NIOSH LED cap lamp technology described in this article is available for licensing. Interested parties are to contact NIOSH Public Health Analyst Kathleen Goedel, (513) 533-8686, to obtain a licensing application or to have specific questions answered on the commercialization of this technology. With a recent national survey indicating the average mine worker age is 43.3 years, NIOSH human subject testing is focusing specifically on how the aging eye responds to light color, light distribution, and glare. As a person ages, there is greater sensitivity to glare, and a reduced amount of light reaches the retina because of smaller pupil size and the yellowing of the eye lens. In response, NIOSH has designed human subject experiments examining how differently lit environments and different lighting options can affect safety in relation to the body’s physical and visual performance. These experiments measure variables such as visual performance with respect to detecting mine hazards, glare, head tilt, walking speed, and a person’s ability to maintain balance. Accident data from the Mine Safety and Health Administration (MSHA) for the years 2007–2011 indicate that slips, trips, and falls are one of the most significant injury classes in underground mines. NIOSH researchers are targeting this problem by using the results from human subject experiments to develop optimized light-emitting diode (LED) technology, which could revolutionize mine illumination. LEDs are robust because they have no glass envelope or a filament that can break, and each LED can provide useful light in excess of 50,000 hours of operation. By comparison, the incandescent bulb can provide about 1,000 to 3,000 hours. This substantially longer life for LEDs has a noteworthy impact on safety, in that there is far less potential for mining injuries directly associated with the maintenance and repair necessary when the inevitable lamp failures occur. From 2002 to 2006, an average of 28 accidents involving lighting occurred annually in US mines, with the greatest number of these taking place when employees were repairing or maintaining lighting. Test results with LED lighting show significant improvements that directly affect mine worker safety, in particular for a NIOSH-developed LED prototype cap lamp designed to improve visual performance. In a comparative study on light color using an incandescent cap lamp, a commercially available LED cap lamp, and the NIOSH prototype, the NIOSH prototype improved the ability of older subjects to detect moving hazards by 15% and trip hazards by 23.7%, and discomfort glare was reduced by 45%. In a light distribution study comparing three commercially available LED cap lamps to the NIOSH prototype, the prototype improved the ability to perceive objects in the visual field by as much as 79.5%, with no increase in discomfort glare. Applying the above lessons learned to future research, NIOSH is currently exploring improvements to self-escape and rescue lighting, and studying the effectiveness of the LED prototype cap lamp and laser lighting in a smoke-filled environment. Other ongoing or planned human subject experiments include testing the use of short wave lighting to improve cognitive performance for workers who work during night shifts, and determining the best way to provide workers on roof bolter machines with improved lighting that will reduce glare and improve their ability to detect hazards and perform their work tasks. and the NIOSH LED prototype cap lamp (right).